Airsoft shhotguns are a necessity of anyone who is starting of in the airsoft career, they are a replica of a firearm, but they shoot 6mm plastic balls instead of real bullets. They are actually quiet a complex device that has many imitations such as m870s, breachers, under and over and many many more. You will find what your looking for here at Bullseye country sport. Do you have to be an airsofter to purchase airsoft replicas? No you do not as we offer a tone service here at Bullseye which means instead of having to get a ukara you can purchase any airsoft gun in either a two tone option either tan or green at ONLY £10 extra. This would be ideal for people like yourself that would be looking to purchase set item to give to their son or daughter to do target practice out the back of your house. 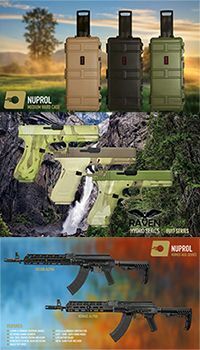 With gun brand names such as ASG, Nuprol, G&G and cybergun in stock along with many others you will be sure to get the right choice of airsoft replica to suits your needs. With variances of m4, m16,g36, ak47 and sniper rifles in stock we definitely have something here for you!